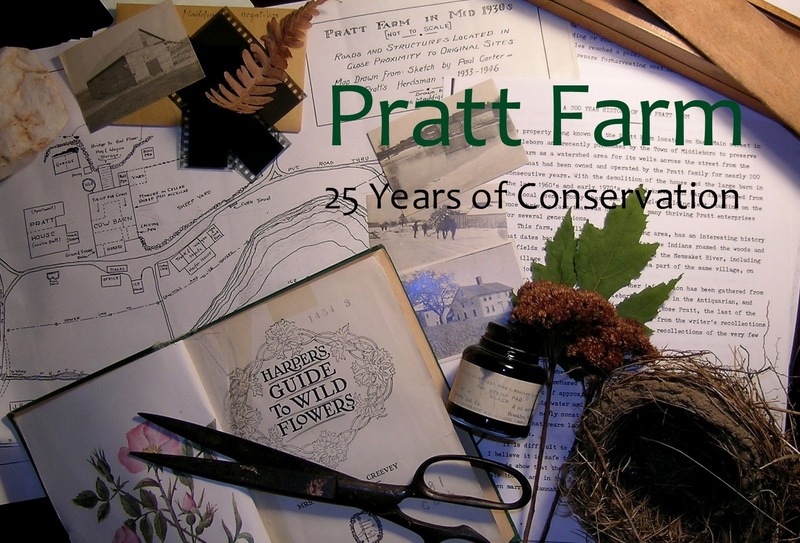 Despite its rich animal life, the Pratt Farm offers even greater diversity in the variety of flora it contains, and the conservation area is a veritable botanical garden for those who wish to explore its plant life which speaks to both the natural and cultural history of the farm. Ironically the profusion of wildflowers which attract butterflies and other insects to the meadows of the Pratt Farm today was considered a matter of grave concern a century earlier when the land was being used to raise fodder such as hay and other grasses. The invasion of what were commonly considered weeds at the expense of commercially-valuable feed grains severely compromised the quality of the crops produced. “The loss from weeds, though not one that can be computed nor even guessed at, is undoubtedly very large, and their growth is a great hindrance to farming, a fact which must impress itself upon every man of observation", wrote one Massachusetts commentator in 1884. 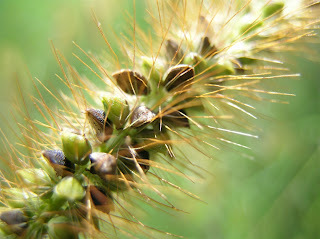 In 1896, botanist G. E. Stone of the Massachusetts Agricultural College, now the University of Massachusetts at Amherst, listed a number of common weeds that should be eradicated from Massachusetts fields, and encouraged farmers to root them out, including a number which today are commonly found in the abandoned hay fields of the Pratt Farm such as ramsted, Queen Anne’s lace and daisy fleabane. Interestingly, Stone believed that the black-eyed Susan would not find a hold in Massachusetts, yet its presence in all the fields at the Pratt Farm belies Stone’s supposition. The bright and pale yellow flowers of this plant give it its common name, "butter-and-eggs". Also known as toadflax, ramsted was unintentionally introduced to New England farms in grain seed, and quickly became a much despised weed. A century ago it was considered a nuisance to be rooted from the commonwealth's pastures. The 1884 Massachusetts Agricultural report criticized ramsted as plants "that nothing will eat, that will allow nothing else to grow to crowd them out, that never die, that spread both by root and seed, that cannot be killed by any ordinary means. Ploughing only multiplies and cultivates them, harrowing enables them to colonize, and digging up and chopping to pieces stem and root makes new plants ready to grow in any opportunity." Ramsted is prolific in sandy, gravelly soil, a preference which explains its prevalence in the fields of the Pratt Farm where such soils predominate. As indicated by the report from 1884, ramsted was poor forage as "nothing will eat it", cattle finding it unappealing due to a bitter, acrid and slightly salty taste. A member of the aster family, daisy fleabane was considered another invasive weed to be eradicated from the fields of the Pratt Farm. Clearly, any effort undertaken to eliminate the plant was unsuccessful as it appears in most fields throughout the farm. Historically, the plant had found a use in folk medicine, however. Dried fleabane was believed to repel fleas. While grasses such as timothy constituted an important crop for the Pratt Farm, invasive grasses like yellow foxtail could compromise the quality of the hay harvested as they had a lower nutritive value than other grains and forage crops. Additionally, yellow foxtail had the potential for crowding out other grasses and its barb-like bristles could become lodged in the mouths, eyes and noses of browsing cattle, with the potential for infection. Given these drawbacks, it is not surprising that it was historically regarded as having little value on the farm. In contrast to plants like ramsted and black-eyed Susan which were introduced to farms like the Pratt Farm accidentally when their seeds became mixed with grain seed, were more desirable plants such as alfalfa, vetch and clover which were cultivated as forage crops. Louise Pratt recollected that “alfalfa was planted on the flat top of the hill by the old pine tree, where a road goes over to a field surrounded by woods.” At the time Brad Pratt first cultivated alfalfa, little was thought of the plant as a fodder by Massachusetts agricultural officials, despite its success in the western portion of the country. At the turn of the century, the Massachusetts Agricultural Experiment Station at Amherst conducted experiments with the plant, the State Agriculturalists reporting in 1901: “There is at the present time so much interest in alfalfa as a forage crop that attention is called to the fact that the results obtained at this station have been distinctly unfavorable. Alfalfa has been under trial in a small way for a considerable number of years, and we have never succeeded in obtaining results encouraging to its general introduction.” Only the heavy application of lime, it was thought, might procure results favorable to alfalfa’s introduction. Since having been planted on the Pratt Farm, the alfalfa has escaped and grown wild, mainly along the Farm Road not far from its original plot at the top of the hill. 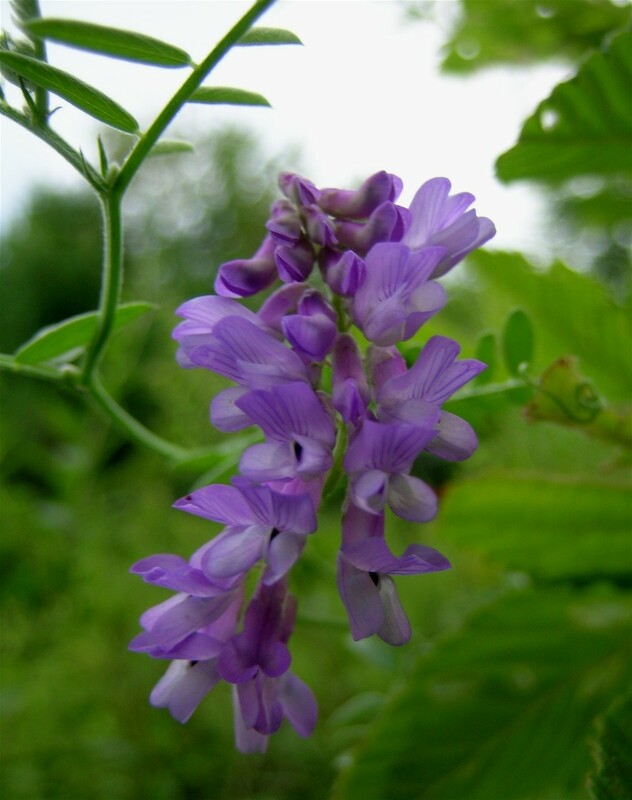 A spray of the unglamorously-named cow vetch.The plant blooms in midsummer and can be found growing in meadows throughout the Pratt Farm including the Big Meadow at the rear of the farm,the small meadow near the new ice pond and the hill above the former sheep yard. 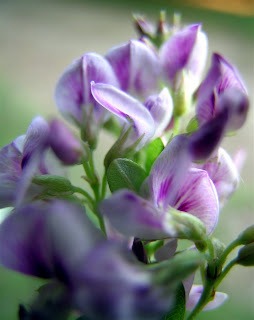 Vetch was an important fodder for cattle, and its presence on the Pratt Farm is no doubt deliberate. Dairy cattle such as those raised by Ernest S. Pratt following 1932 were likely fed vetch as a legume hay. Other plants on the farm are native species which historically had neither value as forage crops nor interfered with the cultivation of such crops. Occurring throughout the farm, however, these plants added beauty and diversity to the landscape. 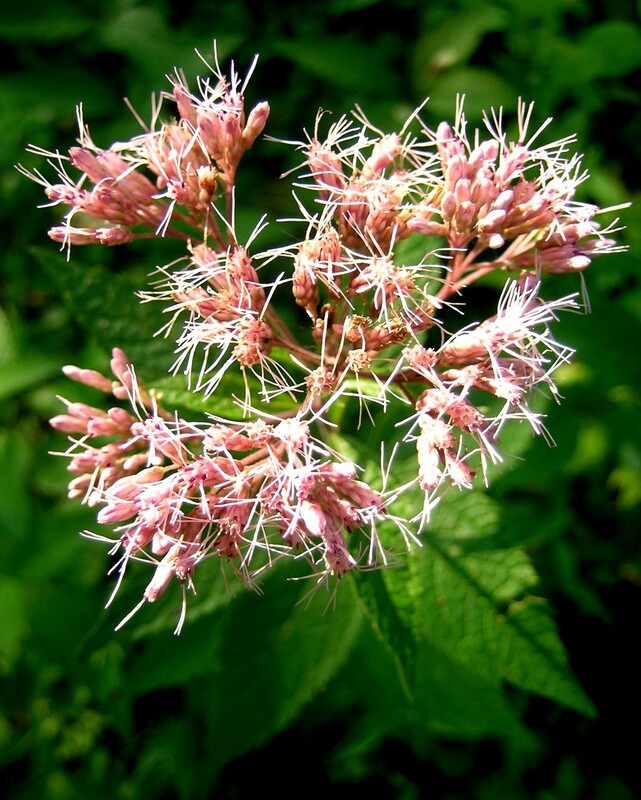 Among them is sweet Joe-Pye weed. 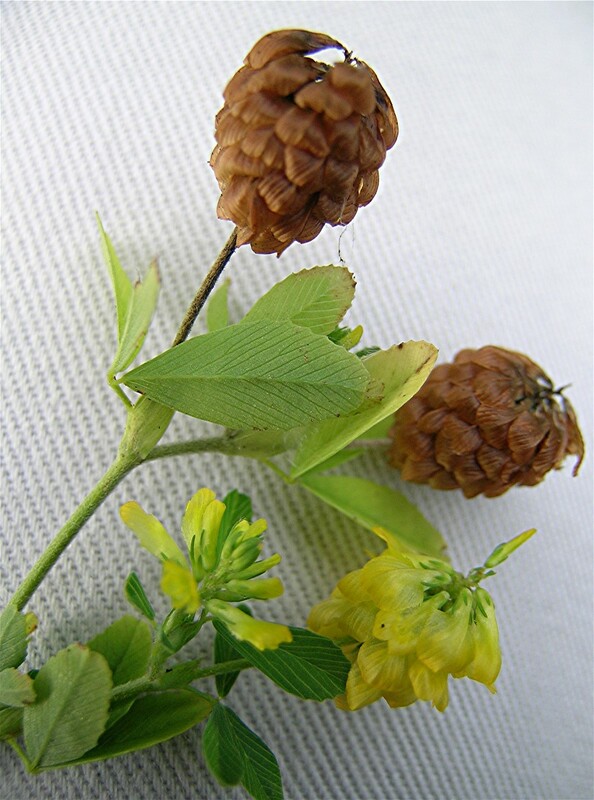 While the origin of the plant's name is uncertain, some claim that it is named for Joe Pye, a Native American herbalist who cured typhus with the plant. Be that as it may, the tale does underscore the importance of such plants to native peoples. Louise Pratt recollected the beauty of the "late asters", no doubt having the late-blooming New England aster in mind. What a delightful place the farm was for us to grow up. We roamed the fields and woods…. 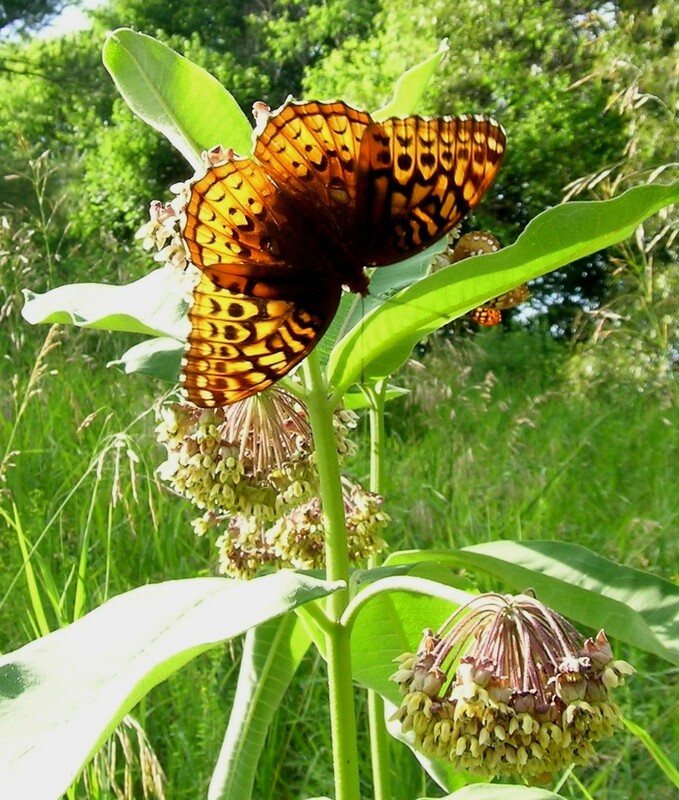 We knew where the wildflowers grew, from the early Jack-in-the-Pulpit to the late wild asters. New England asters are noted in several locations about the farm and are attractive in that they are one of the last plants to bloom in the year. 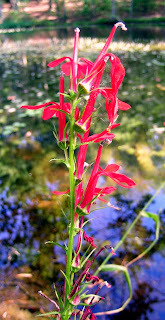 The presence of cardinal flower is betrayed by its conspicuously brilliant color. Thoreau once queried of the flower, "'Thy sins shall be as scarlet.' Is it my sins that I see?" 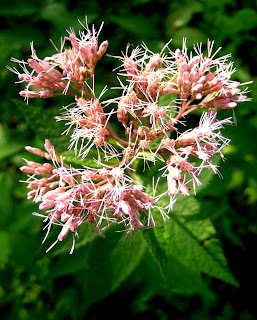 The plant appears in limited areas of the Pratt Farm, blooming in August. Cardinal flower is an endangered species in Massachusetts and should not be picked. It is protected under the same 1935 law which protects lady slippers. Chapter 266 of the General Laws is hereby amended by inserting after Section 116, as appearing in the Tercentenary Edition, the following new section:--Section 116A. No person shall pull up or dig up the plant of a wild azalea, wild orchid or cardinal flower (Lobelia cardinalis), or any part thereof, or injure any such plant or any part thereof except in so far as is reasonably necessary in procuring the flower therefrom, within the limits of any state highway or any other public way or place, or upon the land of another person without the written authority from him, and no person shall buy or sell, or offer or expose for sale, any such flower, or the whole of any part of the plant thereof, knowing or having reasonable cause to believe, that in procuring such flower or plant the foregoing provisions have been violated. Violation of any provision of this section shall be punished by a fine of not more than five dollars." Chicory is perhaps best known as a coffee substitute. Its use was widespread among Confederate soldiers during the Civil War as well as during the Great Depression. Though probably not used as livestock forage on the Pratt Farm, this use for the plant is increasingly gaining acceptance.